I am a sucker for sound. There are records that have 25 reasons not to like them, but when they have a certain sound, I want to have them anyway. 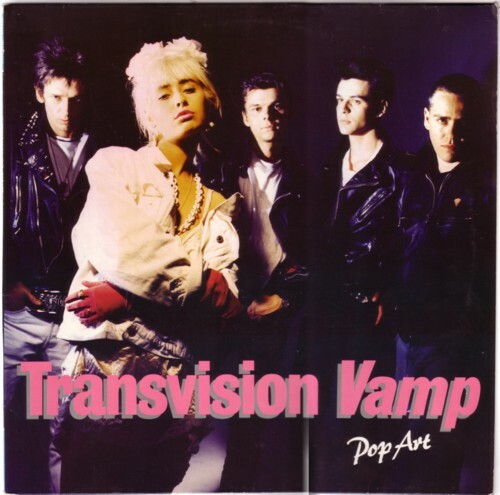 Like Pop Art by the band Transvison Vamp. The band made the LP in 1988, and I never liked the band. I don’t care for the other nine songs on the LP, I just go for Psychosonic Cindy . The woohoo-ing, the power drums, the seventies glitterrock guitar, and the way the band holds back while Wendy James is trying to sing her lyrics, it is enough to excite me every time I hear it. And always I cannot believe that the rest of the LP is so bad as I remember it. Until I play it, and then I cannot believe that Psychosonic Cindy is really so much better than the rest, etcetera, etcetera. The song is written by guitarist Nick Christian Sayer, who also wrote the rest of the songs. He deserved a better singer for his songs. I wish a real good powerpop band would cover this song and release it on a 45. But even then, I am afraid that this LP will be with me for the rest of my life. Like 1001 other one-song-only-LP’s.